"Kavuma himself has a rippling, rich trumpet sound with some pleasingly piercing high notes at his command. 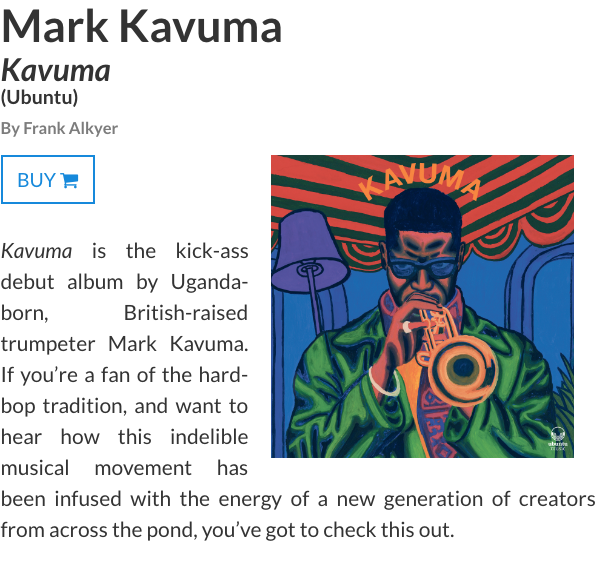 Kavuma Gets The Big Three in Jazzwise! "His love for his material is unimpeachable, but unsurprising." "This band sound like they’d be an absolute riot to see live, so catch them if you can. 'Into the Darkness' cannot be missed!!! Trumpet ace's new music is featured in Sandy Brown Jazz along with corresponding art. For full article, please click image, above.